Ready to think about rats in a new way? This is Dr. Poo. 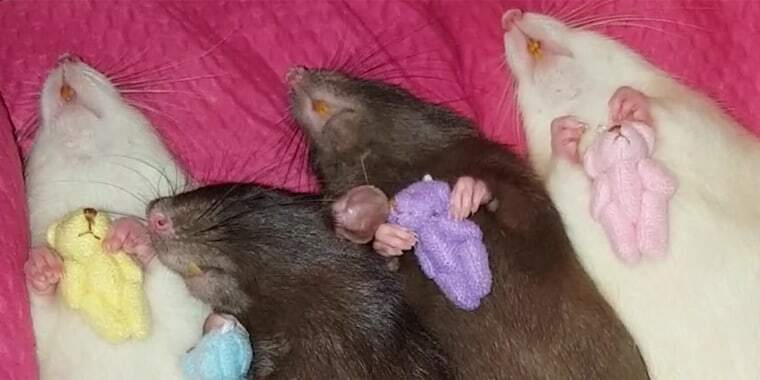 He is a pet rat who likes to nap with teeny-tiny teddy bears, and he's undeniably cute while doing it. Dr. Poo is one of four rats who lives with Anisah Grace Hanna at her home in Te Awamutu, New Zealand. Hanna, as you can discern, loves rats. The 28-year-old also can't help but be aware that not a lot of people share her enthusiasm for the critters, whom she knows to be sweet, smart, clean and affectionate. "I am actually surprised when someone says that they like them or think they're cute. I always feel like I have made a new friend," Hanna told TODAY. Hanna's had rats for much of her life. Mostly, they've just been beloved pets, and not public figures. But a few years ago, Hanna began putting up videos on social media of her rat Gerrat Butler. "It's because of Gerrat that I got a following. Sadly, he passed away last November and a few weeks later I went looking for some new rats to help mend my heart," she said. "Rats are good like that." Hanna, who has training as a veterinary nurse, raves about her rats' darling personalities: Count Furcula is a curious guy who is full of energy; Peego Mortensen likes to eat and watch television; Ratchie McCaw is pretty independent and often naps alone on the windowsill; and Dr. Poo "is a little sweetheart who loves having cuddles." She hopes she's captured the animals' individuality as well as their charm. She also hopes viewers will come away with a new appreciation, and perhaps even some love, for these often-reviled and misunderstood creatures. "I have managed to change people's minds about rats after introducing them to my own or showing them a cute video," Hanna said. "I definitely think they need to be more appreciated in society and for people to see that they aren't scary at all. Rats just want to be loved."